Toronto, July - August, 2017. The arcade cabinet hangs from the ceiling, concealing a projector, computer and a Makey Makey. Designed for 2 or more players, LOVE MACHINE has two flower controllers, which protrude from the arcade. animation of a growing plant. 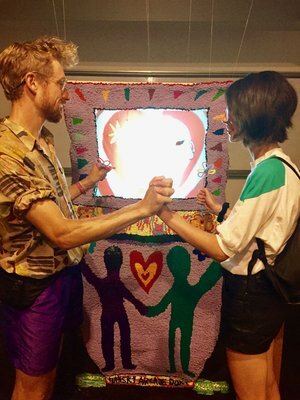 LOVE MACHINE was presented to the public on August 18, 2017, in the residency studio used to develop it.